We offer many types of Temporary Tattoos: Glitter Tattoos, Shimmer Henna, Airbrush Tattoos, and Hand-painted Temporary Tattoos. These are great options for pool parties and teen parties. Shimmer Henna is beautiful on Brides and fun for Bachelorette Parties. Airbrush Tattoos are fast and great for large parties, and our new Airbrush Pro Tattoos look the most like a real tattoo! All ingredients are safe and are intended for use on the skin. We use Professional Temporary Tattoo Ink, Medical grade non-latex Body Glue, Cosmetic Grade Polyester Glitters, Mineral Mica Powders, and Swarovski flat-backed crystals. Temporary Tattoos are waterproof and can last from 3 to 7 days and are removable with 91% or 99% rubbing alcohol or baby oil. If your event has a special image or logo we can have stencils made for glitter tattoos and for airbrush tattoos so your logo can be applied to your guests at your event. Please give a few weeks lead time. Pre-Care: All of our Temporary Tattoos work best on skin that is free from heavy lotions, oils, and excessive hair. 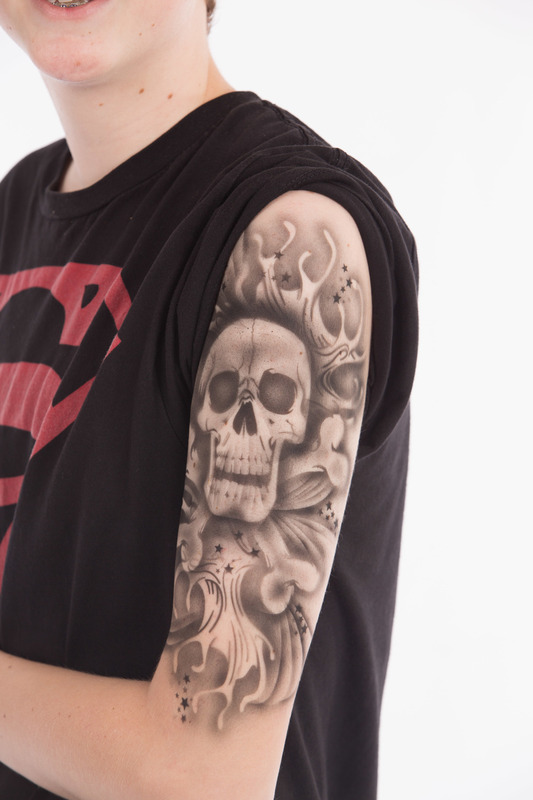 Airbrush Tattoos are applied with a spray gun and stencils using Professional grade temporary tattoo paint. These go on very fast and are a great option for pool parties and teen events. They are dry, and waterproof immediately, and with care can last about a week. I will need access to an electrical outlet at your event. Airbrush Pro Tattoos look the most like a real tattoo, they look amazing but take a little longer to apply than the regular airbrush tattoos, so this option is not ideal for extremely large events. Shimmer Henna is a beautiful and elegant tattoo style! It is applied free hand using non-latex Body Glue, Mineral Mica Shimmer Powders, Cosmetic Polyester Glitter, and Swarovski Crystals. These are dry and waterproof immediately and with care can last about 3-5 days. These are beautiful but they take a lot more time than any of the other options, so are not a good choice for large groups. Glitter Tattoos are applied using Stencils, non-latex Body Glue, and Cosmetic Polyester Glitters. They are vibrantly colored and super sparkly! Fabulous for kids and pool parties! These are dry and waterproof immediately and with care can last 3 to 5 days. Aftercare: To keep your Temporary Tattoo looking good keep any alcohol or oil/lotion based products away from them. Excessive rubbing from clothes or straps will wear down the tattoo. To remove use 91% or 99% rubbing alcohol or baby oil. After several days a good soak in the tub and a good scrubbing with a washcloth can often remove any remaining evidence.